Innovative customer self-checkout via consumer's mobile or tablet device and dynamic pay-at-the-table solution. Cutting edge pay-at-the-table solution that adds tremendous value to POS developers, VARs and their end users by providing both a seamlessly integrated traditional pay at table capability and a consumer self checkout experience through one simple integration specification. Code to one and get them both. 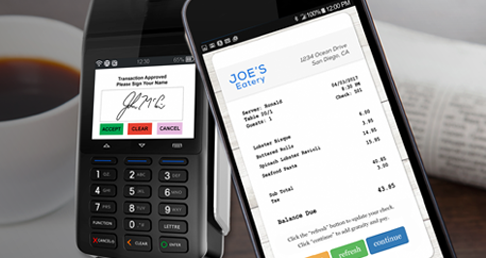 Paygistix Pay at the Table is integrated with leading POS systems such as Micros 3700, Restaurant Manager and others. Software developers looking to add pay at the table or consumer self-checkout support should contact us to discuss integration options. Resellers interested in offering our pay at the table or consumer self-checkout solution should contact us about reseller opportunities. Merchants looking to add a pay at the table or consumer self-checkout to their existing POS system should contact us for more information.